This paper concerns with openness concept in contemporary learning environment, which ranges from physical characters to its relation with learning efficiency and its output. Previous literatures differ to clear the effect of openness on the engagement between learner within themselves, and with this kind of spaces. Engagement means: active participation, the ability of making dialogue, self-reflection and the ability to explore and communicate with them and within learning space. Research roblem was: The lack of knowledge about the effect of Openness on learner engagement with learning spaces. The two concepts were applied on three types of learning spaces in the Department of the Architecture in the University of Technology, according to their measurements. The research found that there are two types of engagment, positive and negative, that effect of openness in learning space, as increasing of the openness in learning space as more of the positive engagement of the learner, offset by a decrease in the negative engagement which cause conditions of the boredom and loss of concentration and scattering the learner mind - within this kind of space.ارتبطت خاصية الانفتاحية بفضاءت التعلم المعاصرة . مرة بارتباطها بالجوانب الفيزيائية ومرة بعلاقتها بكفاءة التعلم وتحسين مخرجاته. تباينت المعرفة السابقة في طرح علاقاتها بتفاعل وسلوك واندماجية المتعلمين ضمن هذه الفضاءات ، والتي تعني المشاركة الفعالة للمتعلم،والقابلية على النقاش والحوارية، والتفكير الذاتي والقدرة على الاستكشافية للمعلومات والتواصل معها ضمن فضاء التعلم. بهذا الجانب تركزت مشكلة البحث في" غياب التصور الكافي عن تأثير انفتاحية فضاءات البيئة التعليمية على درجة أندماجية المتعلمين ضمن هذة البيئات وتفاعلهم مع بعضهم البعض" . تم تحديد اسلوب القياس وطريقته وطُبق على ثلاثة انماط مختلفة من فضاءات التعلم ضمن قسم العماره-الجامعة التكنلوجية. توصل البحث الى وجود نوعين من الاندماجية:أيجابيه وسلبية تقابل الانفتاحية المادية في للفضاء التعليمي، اذ تزداد لاندماجية الايجابية المتعلم بزيادة الانفتاحية بالفضاء التعليمي، يقابله تناقص في الاندماج السلبي المتمثل بحالة الملل وفقدان التركيز وتشتت ذهن المتعلم ضمن الفضاء. The present work aimed to study the efficiency of nanofiltration (NF) and reverse osmosis (RO) process for water recovery from electroplating wastewater and study the factors affecting the performance of two membrane processes. Nanofiltration and reverse osmosis membranes are made from polyamide as spiral wound module. The inorganic materials ZnCl2, CuCl2.2H2O, NiCl2.6H2O and CrCl3.6H2O were used as feed solutions. The operating parameters studied were: operating time, feed concentrations for heavy metal ions, operating pressure, feed flow rate, feed temperature and feed pH. The experimental results showed, the permeate concentration increased and water flux decreased with increase in time from 0 to 70 min. The permeate concentrations increased and flux decreased with increase in feed concentrations from 10 to 300 mg/l. Raising of pressure from 1 to 4 bar, permeate concentration decreased for RO, for NF decreased and then increased at high pressure and increase the flux. The rises of flow rate from 20 to 50 l/h decreased permeate concentration and the flux increase. The rises of temperature from 26 to 40 °C, increased permeate concentration and increased the flux. The rise in pH from 4 to 7, decreased the flux as the pH goes from acidic side towards alkaline. The polyamide nanofiltration membrane had allowed permeation of chromium and copper ions to lower than permissible limits. Nanofiltration membrane had allowed permeation of nickel and zinc ions at low concentration of these ions. The polyamide RO membrane gave a high efficiency for removal of chromium, copper, nickel and zinc and it had allowed permeation of these ions to the lower than permissible limits. The rejection at first three minutes when the feed concentration approximately was constant for chromium in NF and RO, was 99.7% and 99.93%, for copper was 98.43% and 99.33%, for zinc was 97.96% and 99.49%, and for nickel was 97.18% and 99.49% respectively. The maximum recovery for chromium in NF and RO was 71.75% and 48.5%, for copper was 75.62% and 50.68%, for zinc was 80.87% and 54.56%, for nickel was 60.06% and 46.18% respectively. For a mixture of synthetic electroplating wastewater, nanofiltration and reverse osmosis membranes have a high rejection percentage for heavy metal ions. It was obtained pure water and concentrations of less than allowable limits for heavy metals in the case of the mixture. هذا العمل يهدف إلى دراسة كفاءة غشاء النانو وعملية التناضح العكسي لاسترجاع المياه من مياه الصرف الصحي الناتجة من الطلاء الكهربائي، ودراسة العوامل التي تؤثر في أداء الغشائين. اغشية النانو والتناضح العكسي مصنوعة من مادة البولي أميد على شكل ((spiral wound module. المواد غير العضوية كانت كلوريد الزنك، كلوريد النحاس المائي، كلوريد النيكل المائي، و كلوريد الكروم المائي استخدمت ك محلول اللقيم. العوامل التشغيلية التي تم دراستها هي: الزمن, تركيز الداخل, الضغط, التدفق, درجة الحرارة, درجة الحموضة. وأظهرت النتائج التجريبية، تركيز الناتج يزداد و تدفق المياه يقل مع زيادة الوقت (0-70 دقيقة). تركيز الناتج يزداد و تدفق المياه يقل مع زيادة تركيز الداخل (10-300) ملغ/لتر. رفع الضغط (1-4 بار)، تركيز الناتج يقل للتناضح العكسي ويقل ثم يزداد عند الضغط العالي لغشاء النانو ويزداد تدفق المياه. رفع التدفق (20-50 لتر/ساعة)، يقل تركيز الناتج ويزداد الجريان. رفع درجة الحرارة (26-40 درجة مئوية)، يزداد تركيز الناتج ويزداد الجريان. رفع درجة الحموضة (4-7)، يقل الجريان كلما يذهب الرقم الهيدروجيني من الجانب الحمضية نحو القلوية. غشاء بولي أميد NF أتاح تخلل ايونات الكروم والنحاس إلى أقل من الحدود المسموح بها. NF أتاح تخلل أيونات النيكل والزنك إلى أقل من الحدود المسموح بها عندما تتواجد بتراكيز منخفضة. غشاء بولي أميد RO يعطي كفاءة عالية لإزالة الكروم والنحاس والنيكل والزنك، وقد أتاح تخلل هذه الأيونات إلى أقل من الحدود المسموح بها. كان الرفض في ثلاث دقائق الأولى عندما كان تركيز التغذية ثابتا تقريبا للكروم في NF و RO 99.7% و 99.93%، للنحاس هو 98.43% و 99.33%، للزنك هو 97.96% و 99.49%، للنيكل 97.18% و 99.49% على التوالي. وكان الحد الأقصى لاسترداد الماء في حالة الكروم في NF و RO % و 48.5%، النحاس 75.62% و 50.68%، الزنك 80.87% و 54.56%، النيكل 60.06% و 46.18% على التوالي. لخليط من مياه الطلاء الكهربائي الاصطناعية، أغشية النانو والتناضح العكسي لديها نسبة الرفض عالية لأيونات المعادن الثقيلة. تم الحصول على مياه نقية وبتراكيز أقل من الحدود المسموح بها للمعادن الثقيلة في حالة الخليط. nanofiltration --- reverse osmosis --- electroplating wastewater. --- غشاء النانو، التناضح العكسي، مياه الصرف الصحي الناتجة من الطلاء الكهربائي. The present paper addresses cultivation of Chlorella vulgaris microalgae using airlift photobioreactor that sparged with 5% CO2/air. The experimental data were compared with that obtained from bioreactor aerated with air and unsparged bioreactor. The results showed that the concentration of biomass is 0.36 g l-1 in sparged bioreactor with CO2/air, while, the concentration of biomass reached to 0.069 g l-1 in the unsparged bioreactor. They showed also that aerated bioreactor with CO2/air gives more biomass production even the bioreactor was aerated with air. This study proved that application of sparging system for cultivation of Chlorella vulgaris microalgae using either CO2/air mixture or air has a significant growth rate, since the bioreactors become more thermodynamically favorable and provide impetus for a higher level of production. البحث الحالي يتناول دراسة زراعة طحالب الكلوريلا فيلغارس باستخدام مفاعل حيوي ضوئي الايرليفت بتهوية خليط من 5٪ CO2 / الهواء. وتم مقارنة البيانات التجريبية مع التي تم الحصول عليها من مفاعل حيوي ضخ مع الهواء النقي فقط ومفاعل حيوي اخر بدون تهويه. النتائج أظهرت أن تركيز الكتلة الحيوية هو 0.36 g l-1 في مفاعل حيوي مع خليط من CO2 / الهواء، في حين، تركيز الكتلة الحيوية وصلت إلى g l-1 0.069 في مفاعل حيوي بدون تهوية. هذه النتائج اثبتت أن مفاعل حيوي التي ضخ اليه خليط من CO2 / الهواء يعطي مزيدا من إنتاج الكتلة الحيوية من الزراعة في مفاعل حيوي ضخ اليه الهواء فقط .أثبتت هذه الدراسة أن تطبيق نظام التهوية لتفعيل نمو طحالب الكلوريلا فيلغارس باستخدام خليط من CO2 / الهواء أو الهواء النقي فقط يعطي معدل نمو كبير، لأن المفاعلات الحيوية تصبح أكثر ملاءمة للديناميكية الحرارية وتوفر حافزا لمستوى أعلى من الإنتاج. microalgae --- chlorella vulgaris --- airlift photobioreactor --- CO2 biofixing process --- الطحالب --- كلوريلا فيلغارس --- مفاعل حيوي ضوئي الايرلفت --- عملية تثبيت CO2 بايلوجيا. Low incoming discharge upstream of Samarra-Al Tharthar System leads to sediment accumulation and forming islands, especially an island upstream of Al Tharthar Regulator. This island and the sedimentation threaten the stability of the structure and reduce the efficiency of the system. This study aims to hydraulically identify the sedimentation problem mentioned above, to find solutions of how to control the sediment problems, and to develop the capacity of the system for 500 years return period flood of 15060 m3/s. Surface Water Modeling System (SMS10.1) with two dimensional depth average models (RMA-2) software were used to simulate and analyze the system. The results of analysis showed that the maximum permissible discharge through the system was 8250 m3/s where the discharge from Samarra Barrage was 2400 m3/s to avoid flooding in Baghdad city. The water surface level could be lowered during constructing; the new Al Tharthar Regulator expansion capacity of 7000 m3/s in the case of peak flood (15060 m3/s) to 68.51 m.a.m.s.l. upstream of Samarra Barrage by dredging the island and channel. On the other hand, during constructing the guide bank, and dredging the island and channel, the water surface elevation was 68.91 m.a.m.s.l. upstream of Samarra Barrage.تسبب انخفاض الايرادات المائية مقدم منظومة سامراء- ثرثار في تراكم الترسبات وتكون الجزرات وخصوصا الجزرة المقابلة للناظم وهذه الجزر والترسبات تهدد استقرار هذا الهيكل وتقلل من كفاءة المنظومة. تمت دراسة استيعاب المنظومة وفقا لواقع الحال وكذلك الاعتماد على ثلاثة سيناريوهات اساسية في دراسة المنظومة وهي سنوات الجافة والفيضانية. وتم توظيف برنامج نظام نمذجة المياه السطحية (SMS10.1) والموديل ثنائي البعد RMA2 لإعداد نموذج رياضي ثنائي البعد يحاكي المنظومة من اجل دراسة الاداء الهيدروليكي للمنظومة خلال السنوات الفيضانية والجافة وتحري السعة الفعلية لها وايجاد الحلول اللازمة لتحسين سعة المنظومة وتطويرها لإمرار موجة فيضانية بتصريف 15060 م3/ ثا لفترة عودة 500 سنة . من نتائج المحاكاة استنتج ان الحد الاقصى المسموح لاستيعاب المنظومة هو 8250 م3/ ثا حيث ان التصريف المطلق من سدة سامراء 2400 م3/ ثا لضمان عدم فيضان مدينة بغداد. وأوطأ منسوب ممكن تحققه عند انشاء ناظم توسعة الثرثار الجديد ذو سعة 7000 م3/ ثا في حالة فيضان 15060م3/ ثا كان 68.51 م فوق مستوى سطح البحر مقدم سدة سامراء مع كري الجزرة والقناة. وعند انشاء السدة الموجهة وكري الجزرة والقناة تعطي منسوب المياه مقدم سدة سامراء 68.91م فوق مستوى سطح البحر و 66.6م فوق مستوى سطح البحر مقدم ناظم الثرثار. This work aimed to design, construct and operate a new laboratory scale water filtration system. This system was used to examine the efficiency of two ceramic filter discs as a medium for water filtration. These filters were made from two different ceramic mixtures of local red clay, sawdust, and water. The filtration system was designed with two rotating interfered modules of these filters. Rotating these modules generates shear force between water and the surfaces of filter discs of the filtration modules that works to reduce thickness of layer of rejected materials on the filters surfaces. Each module consists of seven filtration units and each unit consists of two ceramic filter discs. The average measured hydraulic conductivity of the first module was 13.7mm/day and that for the second module was 50mm/day. Results showed that the water filtration system can be operated continuously with a constant flow rate and the filtration process was controlled by a skin thin layer of rejected materials. The ceramic water filters of both filtration modules have high removal efficiency of total suspended solids up to 100% and of turbidity up to 99.94%.هدف هذا العمل هو تصميم وانشاء وتشغيل منظومة جديدة بمقياس مختبري لترشيح المياه. استخدمت هذه المنظومة لفحص كفاءة اثنين من المرشحات الخزفية كوسط لترشيح المياه. تم تصنيع هذه المرشحات الخزفية من اثنين من الخلطات الخزفية من الطين الاحمر المحلي مع نشارة الخشب والماء. صممت منظومة الترشيح باثنين من وحدات ترشيح متداخلة ودوارة من هذه المرشحات. يعمل تدويرهذه الوحدات على توليد قوة قص بين الماء وسطوح اقراص الترشيح التي تعمل على تقليل سمك طبقة المواد المرفوضة على سطوح المرشحات. تتألف كل وحدة من سبعة مفردات من المرشحات، وكل مفردة تتألف من اثنين من اقراص المرشحات الخزفية. كان معدل الايصالية الهيدروليكية المقاسة للوحدة الاولى 13.7 ملم/اليوم وللوحدة الثانية 50 ملم/اليوم. بينت النتائج ان منظومة ترشيح المياه لها القابلية على العمل باستمرار بمعدل تصريف ثابت وان عملية الترشيح محكومة بطبقة رقيقة من المواد المرفوضة المتراكمة على اسطح المرشحات. تمتلك مرشحات الماء الخزفية لكل من وحدتي الترشيح كفاءة عالية في ازالة المواد العالقة الكلية تصل الى 100% وفي ازالة العكورة تصل الى 99.94%. ceramic filters --- filtration system --- water filtration --- water purification. A tungsten inert gas (TIG) welding is one of the most popular kinds of welding used to join metals mainly for aluminum alloys. However, many challenges may be met with this kind of joining process; these challenges arise from decay of mechanical properties of welded materials. In the present study, an attempt was made to enhancing the mechanical properties of TIG weld joint of 6061-T6 aluminum alloy by hardening the surfaces using shoot peening technique. To optimize the shoot peening process three times of exposure (5, 10, and 15) min. was used. All peened and unpeened, and welded and unwelded samples were characterized by metallographic test to indicate the phase transformation and modification in microstructure occurring during welding process. Tensile test and Vickers micro-hardness measurements were performed for all samples to investigate the effect of shoot peening on mechanical properties of welded aluminum. The results indicated a significant improvement in properties for peened welded and unwelded samples compared with those unpeened one. Also, the results showed that the tensile and micro-hardness properties were increased with increasing the time of exposure to 15 min. due to generation of compressive residual stresses at surface.تعتبر عملية اللحام بقطب التنكستن المحمي بالغاز الخامل (TIG) من اكثر انواع اللحام انتشارا والمستخدمة لربط المعادن وخصوصا سبائك الالمنيوم. رغم هذا فهناك العديد من التحديات والتي ممكن مواجهتها عند استخدام هذا النوع من عمليات الربط. هذه التحديات ناشئة من انخفاض الخواص الميكانيكية للمواد الملحومة. في الدراسة الحالية تم عمل محاولة لتحسين الخواص الميكانيكية لوصلة من سبائك الالمنيوم (6061-T6) ملحومة بطريقة اللحام بقطب التنكستن المحمي بالغاز الخامل (TIG) من خلال تصليد السطح باستخدام تقنية القذف بالكرات. وللوصول الى الاسلوب الامثل في عملية القذف بالكرات تم استخدام ثلاث ازمان للتعرض (5,10,15) دقيقة. تم توصيف جميع العينات المعاملة بالقذف بالكرات وغير المعاملة، الملحومة وغير الملحومة من خلال فحص سطح المعدن لبيان التحولات الطورية والتغيرات الحاصلة خلال عملية اللحام. تم اجراء فحص الشد وقياس صلادة فيكرز المجهرية لجميع العينات لدراسة تاثير القذف بالكرات على الخواص الميكانيكية لملحومات الالمنيوم. بينت النتائج تحسن ملموس في خواص العينات المعاملة بالقذف بالكرات الملحومة وغير الملحومة مقارنة بالعينات الغير معاملة. بينت النتائج ايضا ان خواص الشد والصلادة المجهرية قد ازدادت مع زيادة زمن التعرض الى 15 دقيقة نتيجة لتوليد مستويات اعلى من اجهادات الضغط المتبيقية عند السطح. shot peening --- TIG welding --- aluminum alloy 6061 -T6. Unsaturated polyester was used as a matrix which was filled with different percentages of cobalt ferrite using hand lay-up method. Cobalt ferrite was synthesized using solid state ceramic method with reagent of CoO and Fe2O3. Mechanical properties such tensile strength, Young's modulus and shore D hardness of the composite have been studied. All these properties have increased by 10% with increasing cobalt ferrite contents. Also the thermal properties such thermal conductivity and specific heat capacity are highly increased as the ferrite content increased, while the thermal diffusivity increased by 22 %. On the other hand dielectric strength of composite has been measured which increased by 50% by increasing the cobalt ferrite content. استخدم البوليستر غير المشبع كمادة اساس وذلك بتدعيمها بنسب مختلفة من فرايت الكوبلت , تم تحضير المتراكبات بالطريقة اليدوية. أستخدمت طريقة الحالة الصلبة السيراميكية وهي احدى الطرق التقليدية في تحضير فرايت الكوبلت . درست الخواص الميكانيكية مثل متانة الشد , معامل يونك وصلادة شور دي. كل هذه الخواص تأثرت باضافة فرايت الكوبلت حيث تزداد هذه الخواص مع زيادة نسبة الكوبلت فرايت. اما الخواص الحرارية مثل التوصيلية الحرارية والنفاذية الحرارية والسعة الحرارية النوعية فقد تم دراستها وايضا تأثرت باضافة فرايت الكوبلت حيث ازدادت بصورة بسيطة. ايضا تم دراسة متانة العزل لهذا المتراكب وازدادت بزيادة محتوى فرايت الكوبلت. cobalt ferrite --- thermal conductivity --- thermal diffusivity --- specific heat capacity --- tensile strength --- dielectric strength. --- كوبلت فرايت --- التوصيلية الحرارية --- الانتشارية الحرارية --- السعة الحرارية النوعية --- مقاومة الشد --- مقاومة العزل الكهربائي. In this investigation, Rayleigh–Ritz method is used to calculate the natural frequencies of rectangular isotropic and laminated symmetric and anti-symmetric cross and angle ply composite plate with general elastic supports along its edges. Each of the admissible functions here is composed of a trigonometric function and an arbitrary continuous function that is introduced to ensure the sufficient smoothness of the so-called residual displacement function at the edges. Perhaps more importantly, this study has developed a general approach for deriving a complete set of admissible functions that can be applied to various boundary conditions. 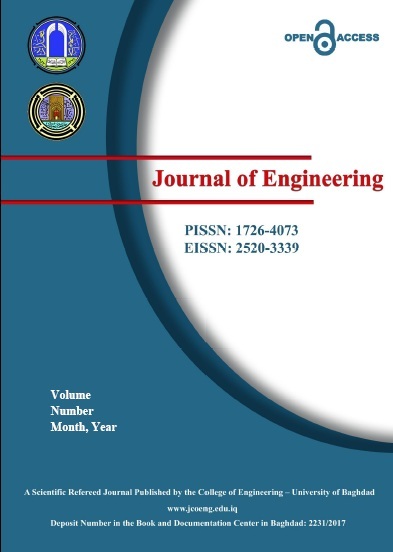 Several numerical examples are studied to demonstrate the accuracy and convergence of the current solution with considering some design parameters such as boundary conditions, aspect ratio, lamination angle, thickness ratio, orthotropy ratio, also these results are compared with other researchers and give a good agreement .في هذة الدراسة , تستخدم طريقة Rayleigh–Ritz لأيجاد التردد الطبيعي للصفيحة الموحدة الخواص والمركبة المستطيلة ذات الزوايا المتعامدة والمائلة ,المتماثلة والغير متماثلة مع ظروف اسناد لحافاتها مختلفة . والدوال المستخدمة في هذا البحث يمكن ان تمثل بدوال مثلثية و دوال عشوائية مستمرة و ذلك لضمان السلاسة المطلوبة لعمل الدالة الرئيسية . ولعل الأهم من ذلك، ان هذه الدراسة قد طورت اسلوب عام لاشتقاق مجموعة كاملة من الدوال المقبولة التي يمكن تطبيقها لشروط اسناد الحافات المختلفة. لقد تم دراسة عدة امثلة عددية لاثبات دقة وتقارب نتائج الحل الحالي مع الاخذ بنظر الاعتبار تغيير في بعض معايير التصميم مثل شروط الحدود، نسبة الارتفاع، وزاوية التصفيح، ونسبة سماكة، ونسبة الـ orthotropy ,حيث تم مقارنة النتائج مع باحثين اخرين واعطت تقارب جيد جدا . free vibration --- Rayleigh–Ritz method --- general boundary condition --- composite laminated plate --- نظرية القص ذات الرتبة العالية --- الالواح الطبقية المركبة --- التحليل الاستاتيكي . The aerodynamic characteristics of general three-dimensional rectangular wings are considered using non-linear interaction between two-dimensional viscous-inviscid panel method and vortex ring method. The potential flow of a two-dimensional airfoil by the pioneering Hess & Smith method was used with viscous laminar, transition and turbulent boundary layer to solve flow about complex configuration of airfoils including stalling effect. Viterna method was used to extend the aerodynamic characteristics of the specified airfoil to high angles of attacks. A modified vortex ring method was used to find the circulation values along span wise direction of the wing and then interacted with sectional circulation obtained by Kutta-Joukowsky theorem of the airfoil. The method is simple and based mainly on iterative procedure to find the wings post stall aerodynamic results. Parametric investigation was considered to give the best performance and results for the rectangular wings. Wing of NACA 0012 cross sectional airfoil was studied and compared with published experimental data for different speeds and angle of attacks. Pressure, skin friction, lift, drag, and pitching moment coefficients are presented and compared good with experimental data. The present method shows simple, quick and accurate results for rectangular wings of different cross-section airfoils.تمت دراسة الخصائص الايروديناميكية للاجنحة الثلاثية الابعاد المستطيلة الشكل باستخدام التاثير اللاخطي المتبادل بين طريقة الالواح لزج-غير لزج ثنائية البعد وطريقة الدوامة الحلقية .ان الجريان الكامن لجنيح ثنائي البعد بطريقة Hess و Smith البدائية قد استخدم مع الطبقة المتاخمة الطباقية ,الانتقالية والمضطربة لحل الجريان حول اشكال معقدة من الجنيحات متضمنا تاثير الانهواء فيها .طريقة فيترنا استخدمت لتمديد الخواص الايروديناميكية للجنيح الى زوايا هجوم عالية .طريقة الدوامة الحلقية المعدلة استخدمت لايجاد قيم التدوير على طول امتداد الجناح وايجاد تاثيرها مع التدورة المقطعي الماخوذة من نظرية Kutta-Joukowsky للجنيح. الطريقة بسيطة وتعتمد اساسا على عملية التاثير المتبادل لايجاد النتائج الايروديناميكية الاجنحة ما بعد الانهواء. تمت دراسة العوامل التي تعمل على اعطاء افضل اداء ونتائج للمسالة . الجناح ذو مقطع مطيار NACA 0012 تمت دراسته ومقارنته مع البيانات العملية المنشورة لمختلف السرع وزوايا الهجوم. معامل الضغط, الاحتكاك, الرفع, الممانعة, و عزم التارجح قد تم عرضها ومقارنتها جيدا مع البيانات العملية. ان الطريقة الحالية تظهر بساطة, سرعة ودقة النتائج للجناح المستطيل ولمختلف مقاطع الجنيحات. Experimental measurements of viscosity and thermal conductivity of single layer of graphene based DI-water nanofluid are performed as a function of concentrations (0.1-1wt%) and temperatures between (5 to 35ºC). The result reveals that the thermal conductivity of GNPs nanofluids was increased with increasing the nanoparticle weight fraction concentration and temperature, while the maximum enhancement was about 22% for concentration of 1 wt.% at 35ºC. These experimental results were compared with some theoretical models and a good agreement between Nan’s model and the experimental results was observed. The viscosity of the graphene nanofluid displays Newtonian and Non-Newtonian behaviors with respect to nanoparticles concentration and temperature, and about 111% enhancement was obtained compared to the base fluid with GNPs weight fraction concentration of 1wt.% at 35ºC. Based on the experimental data, correlations were developed for predicting thermophysical properties of the GNPs based DI-water nanofluid.قياسات اللزوجة والموصلية الحرارية للمائع النانوي احادي الطبقه (كرافين- ماء) اجريت وفقا لكل من التراكيز 0.1-1wt%)) ودرجة حرارة 5 to 35ºC)). اظهرت النتائج ان الموصلية الحرارية للمائع النانوي (كرافين- ماء) تزداد بزيادة تركيز الجزيئات النانوية للكرافين ودرجة حرارة المائع وكان الحد الأقصى للتعزيز حوالي 22% لتركيز (1 wt %) في (35ºC). هذه النتائج التجريبية قورنت مع بعض النماذج النظريه ورصد اتفاق جيد بين نموذج نان والنتائج التجريبية. اللزوجة للمائع النانوي (كرافين- ماء) يبدي سلوك نيوتيني وغير نيوتيني اعتمادا على تركيز الجزيئات النانوية ودرجة الحرارة، ونحو 111%زيادة مقارنه مع السائل الأساسي مع تركيز1wt %) ) ودرجة حرارة .35ºC استنادا إلى البيانات التجريبيه ، تم ايجاد علاقات ترابطيه للتنبوء بالخصائص الحراريه للمائع النانوي كرافين-ماء.